Growing agricultural sectors pose problems for water management and ecosystems. Expanding agriculture sectors in developing countries are expected to drive growth in world food production during the next decade, posing challenges for water. 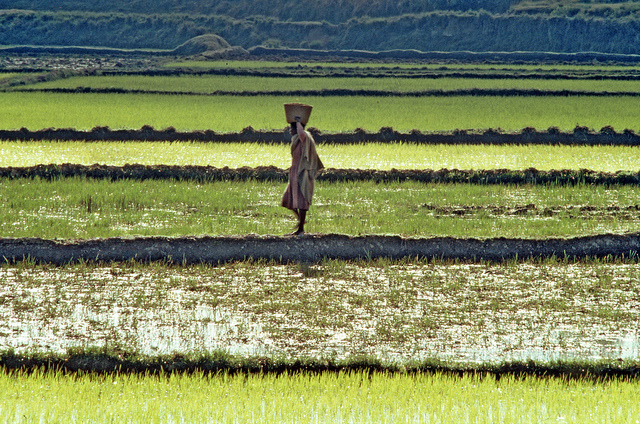 Here, a farmer tends to rice fields in Madagascar. Click to see an enlarged image. Developing countries will account for much of the world’s growth in agricultural production, demand, and trade during the next decade, as production growth in developed countries slows, according to reports from leading food policy organizations. The shift will pose challenges for the quality and abundance of water supplies in regions like South America, Asia and Africa. Global agricultural production is projected to grow at 1.5 percent annually, down from 2.1 percent in the past decade. The trend reflects rising input costs, as well as scarcer resources like water and land. Low food stocks will increase the risk of price volatility. Droughts and other weather shocks, combined with low stocks, could raise crop prices 15-40 percent. Droughts in Central Asia, Eastern Europe and the United States played a large role in volatile food prices in 2012. The idea of a “green economy” received more attention at international meetings like the 2012 Rio+20 conference. The goal is to create sustainable development and eradicate poverty. Least Developed Countries—defined by the United Nations as “low-income countries suffering from the most severe structural impediments to sustainable development”— have the greatest potential for increasing food production in the next decade. These countries are expected to exceed the world average in agricultural growth, at a rate of about 2.75 percent through 2022, while the agricultural sectors of Brazil, Russia, India and China will grow by 1.5 percent per year. In developed countries, on the other hand, farm output will increase just 0.75 percent annually over the next decade. “Most food demand and food production growth is expected to occur in the group of developing countries, as population and economic growth are centered in these regions.” Claudia Ringler, Deputy Division Director of Environment and Production Technology at the Washington, D.C.-based International Food Policy Research Institute (IFPRI), wrote to Circle of Blue. IFPRI’s 2012 Global Food Policy Report also concluded that developing countries will play a larger role in world food production and trade. Growing agricultural sectors are leading to a “host of challenges” for water in developing countries, though these challenges vary case by case, Ringler said. As Circle of Blue found in India, even countries with abundant water supplies face scarcity issues due to this lack of management and conservation. Some countries, like Vietnam, that subsidize water for farmers have removed even the small irrigation service fees following the recent spate of food price crises, Ringler said. Other regions face a combination of high demand, natural scarcity, and “pollution-induced” water scarcity. While agricultural growth provides developing countries with an opportunity to improve water management, many are facing the same pollution and water depletion problems that have occurred in developed countries. In order to meet the water-agriculture challenge—in terms of water supply—countries are turning to a number of solutions. The development of multi-purpose dams for storing irrigation water, the implementation of advanced irrigation technologies, and research into crops that can tolerate droughts and floods, are all methods being pursued by developing countries to secure water and improve agricultural yields, according to Ringler.